​In 2006, the Stavros Niarchos Foundation (www.snf.org) announced its plans to fund the development of the Stavros Niarchos Foundation Cultural Center (SNFCC), a project that includes the construction and complete outfitting of new facilities for the National Library of Greece (NLG) and the Greek National Opera (GNO), as well as the creation of the 210,000 m² Stavros Niarchos Park. 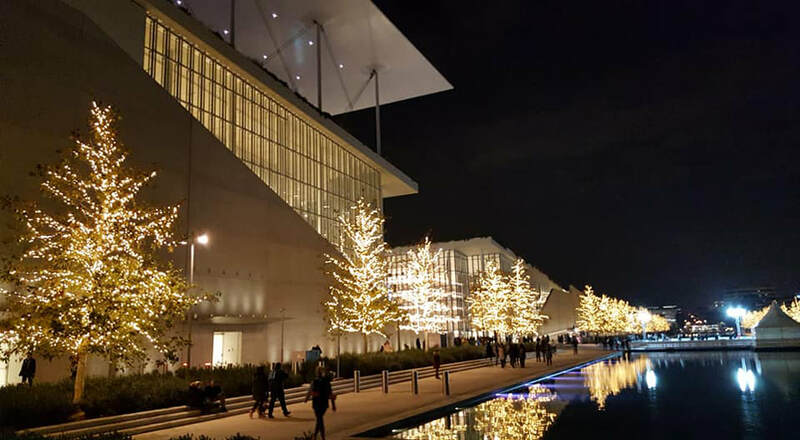 The Stavros Niarchos Foundation Cultural Center in a holiday spirit. The magnitude of the project and of the Foundation’s dreams and hopes required the impact and the creative presence of a visionary architect. In February 2008, following a closed international design competition, the Foundation’s Board of Directors unanimously selected the Renzo Piano Building Workshop (www.rpbw.com). In selecting renowned architect Renzo Piano, the Foundation chose an architect at the forefront of the architectural profession, who possesses vision, intellectual curiosity and a historical and geographical understanding of the project’s location and significance. The project site is located 4.5 km south of the center of Athens, on the edge of Falero Bay, and the SNFCC is designed as a multifunctional arts, education and entertainment complex. The project's total budget of $854 mil (€617 mil) includes two grants of $6 mil (€5 mil) each to the National Library of Greece and the Greek National Opera respectively, aiming to support the organizations’ transition to their new facilities. Upon SNFCC’s completion, the Foundation will transfer the control of the center to the Greek state, which will assume its full operation and management. 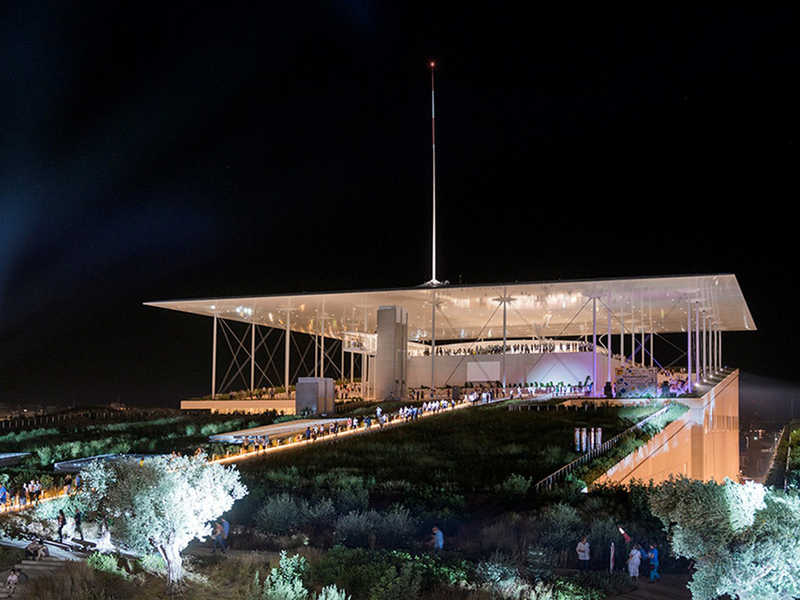 The SNFCC is the first private-public partnership of its type in Greece, and one of the most important civic (cultural/educational) projects ever undertaken in the country. As one of the largest construction projects in recent Greek history, the Stavros Niarchos Foundation Cultural Center will have an immediate impact on the local economy, providing jobs and infusing capital into a challenging economic landscape. 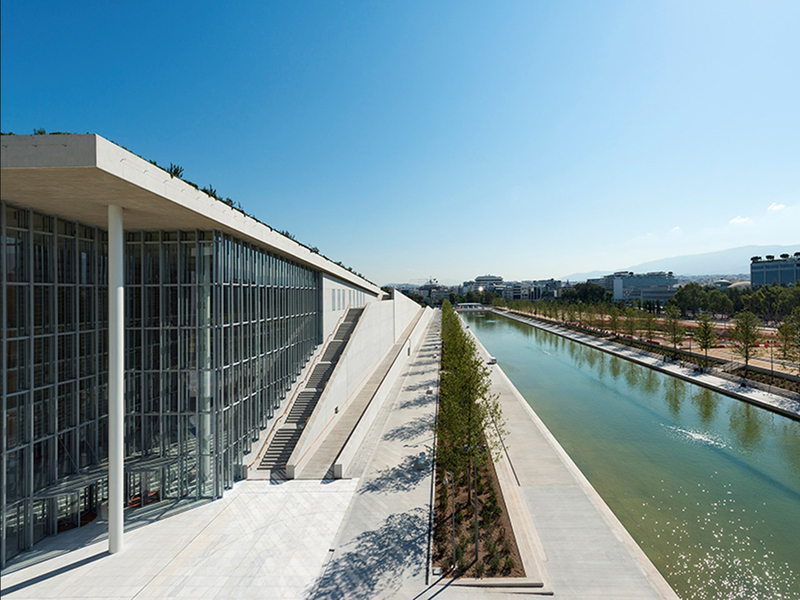 ​The idea for the SNFCC started to form in 1998 with the Foundation’s decision to support the construction of new facilities for the National Library of Greece (NLG). The plan was consistent with the Foundation's extensive and continuous support of a wide variety of educational initiatives worldwide. The plan was not only to consolidate the Library's holdings, but also to upgrade significantly its facilities and consequently elevate its status to become a true national library. The vision for the new National Library was that of a public institution that would provide access to the world of knowledge and information to learners of all ages, offer a wide range of research and information resources, and connect with other libraries in Greece, as well as with other National Libraries around the world. The concept was presented to the Government, which expressed its support. At the same time and independent of this initiative, the Foundation was considering a proposal to support the Greek National Opera (GNO), an institution also in need of a major physical and therefore organizational upgrade. An exciting possibility emerged from these disparate plans, one that was a perfect synthesis of the Foundation's mission and its commitment to Greece, and could provide a lasting and transformative impact. The plan envisioned including the National Library of Greece, the Greek National Opera, and an educational and cultural park in one site, and thus bequeathing to the Greek people a great civic, cultural, educational and environmentally responsible landmark of international stature. In 2006, ten years after the commencement of its grant-making activities, the Stavros Niarchos Foundation announced its intention to proceed with its largest individual grant to date, the Stavros Niarchos Foundation Cultural Center. After discussions between the former Ministry of Environment and Public Works and the Municipality of Kallithea, a consensus emerged that the Project will be developed at the site of the old horse racing track. 210,000 m² (50 acres) of the site's total area of 240,000 m² were designated for the Stavros Niarchos Foundation Cultural Center and Esplanade. The remaining seven acres (30,000 m²) were designated for the creation of a Municipal Sports and Leisure Park for the Municipality of Kallithea. In 2007, once preliminary studies had demonstrated the project's viability, the Foundation and the Greek State signed a Memorandum of Understanding. In March 2009, the two parties signed an agreement for the construction of the SNFCC, which four months later was ratified by the Greek Parliament. The agreement stated in part that the Foundation undertook the responsibility to assume the total cost of building the SNFCC, and that, upon completion, will donate it to the Greek State, which will undertake its full control and operation, to be used and enjoyed by the people. ​The new building for the National Library of Greece will modernize the institution allowing it to strengthen its research role while expanding, at the same time, its focus from an exclusive research facility to an all-inclusive public resource. In its new and enlarged role, the Library will support patrons of all ages and education—from academic researchers to children and young adults destined to become the next generation of users.The entrance to the Library leads into a large open lobby that provides an immediate visual orientation to all the organization’s functions. The lending library, bolstered by a significant book collection and other media, will include separate areas for adults, teenagers, and children and will offer a wide range of educational and cultural programs. The natural light available throughout the National Library will help create an open hospitable environment for individual and collaborative learning. Events and seminars will be hosted for both children and adults, and classes will incorporate natural learning opportunities originating from collaborative programs at the Stavros Niarchos Park as well. ​The nearly 22,000 m² (235,000 sq. ft.) state-of-the-art building combines traditional with technological innovation, conservation with information and communication. The flexibility of its design ensures that the National Library can respond effectively to ever-changing needs and the challenges of the digital age. A nationwide digitization project will help make heritage materials available to the public and will offer access to the Library’s various collections. Connectivity with other libraries both nationally and globally will allow the Library’s users access to material abroad that is relevant to Greece or Hellenism. In addition, a Business Center will provide the public with an active hub for enterprise, knowledge, and innovation, offering computer workstations, laptops, and wireless connectivity. Τhe Stavros Niarchos Foundation Cultural Center. ​In its new home, the Greek National Opera ( www.nationalopera.gr ) will become an exciting destination for music lovers and architecture cognoscenti alike. The building will be a multi-use venue capable of hosting a variety of performances and events. Its stages will accommodate opera productions, musicals, concerts, theater performances, ballets, and multimedia art programs. Concrete walls towering six stories high dominate the lobby, create the feeling of being inside a “quarry”, and define the dramatic purpose of the stages within. The main block of the opera house is surrounded by several suspended light balconies, with “holes” leading inside the auditorium and alcoves where all the different loge areas are located at every level, providing patrons an opportunity to appreciate the impressive backdrop close-up.The new 28,000 m² (301,000 sq. 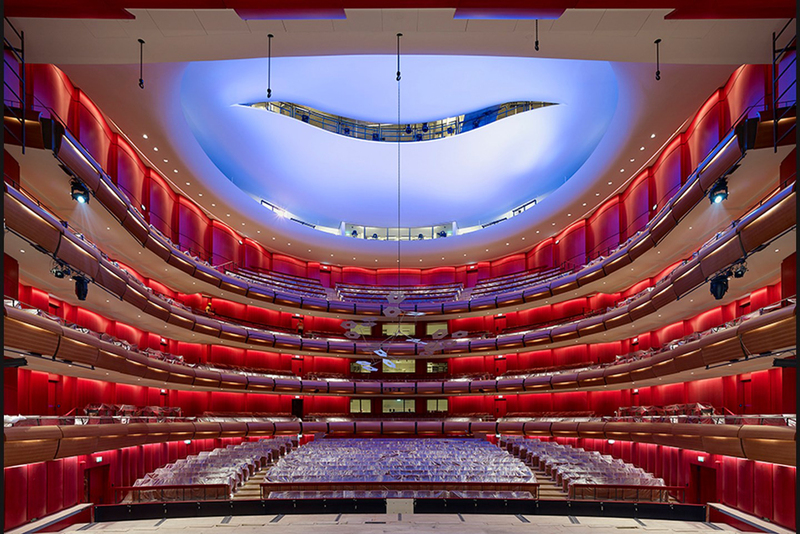 ft.) auditorium is an architectural jewel, designed to enhance the opera experience for patrons and artists alike. Its world-class acoustics, mechanical capabilities, flexible staging, and innate beauty will position it for immediate entry into the world opera circuit, ready to play host to the most technically demanding operas, international multimedia art productions, and formidable solo vocalists. The auditorium is in par with the best European opera houses, and its multiple stages configuration allows for efficient scene changes and the staging of complicated productions. The comfort of the 1,400-seat main auditorium will be equaled in the backstage dressing rooms and rehearsal spaces, and the technical capabilities will extend to the scenic design and costume shops. The new opera house presents the Greek National Opera with opportunities to strengthen its educational and outreach programs through lectures, seminars, and other events. The organization has developed in the last few years, a children’s stage to attract younger audiences and engage future generations of opera-goers, and expanded its children’s programming to include tours of children’s performances, educational programs, age-specific seminars, and innovative activities. The Greek National Opera will be able to take advantage of new wireless technologies to present productions via the Internet to other Greek cities, as well as employ the Stavros Niarchos Park as an outdoor theater for selected video-link and also outdoors live performances. A smaller alternative stage with a capacity of 400 people will host more intimate productions, including GNO’s experimental performances, contemporary Greek music, dance, dramatic readings, and theater productions in a venue with technical capabilities on par with the main performance space. The small theater has a flexible layout with no fixed seating, making it ideal for experimental productions. A school of dance will also reside at the SNFCC. The Greek National Opera new house at the Stavros Niarchos Foundation Cultural Center. 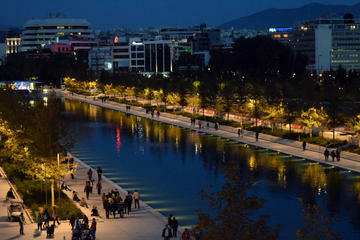 Linked by an ecological concept, physical topography and functionality to the National Library of Greece and the Greek National Opera, the Stavros Niarchos Park will be a vital green space, a breath of life for Athens and an important addition to a city with the lowest per capita green space in Europe. A respite from urban concrete, the Park provides opportunities for learning, recreation, rest, and new experiences. The Stavros Niarchos Park offers many surprises to its visitors. Its lush garden landscape, featuring a wide range of trees, plants, water fountains, allées, paths, playgrounds and open spaces, turns every visit into a unique experience. The visitors arriving to the Park from the streets of Kallithea to the north are greeted with the sound and movement of water jets. Guests can rest in specially designed seating areas or explore a nearby circular labyrinth. Children can play in creative playgrounds of innovative design. The Park is ideal for the capital’s children, who can play undisturbed in its playgrounds, but also for all citizens, who will be able to enjoy their leisure walk, exercise or attend concerts, exhibitions, and a multitude of other events. 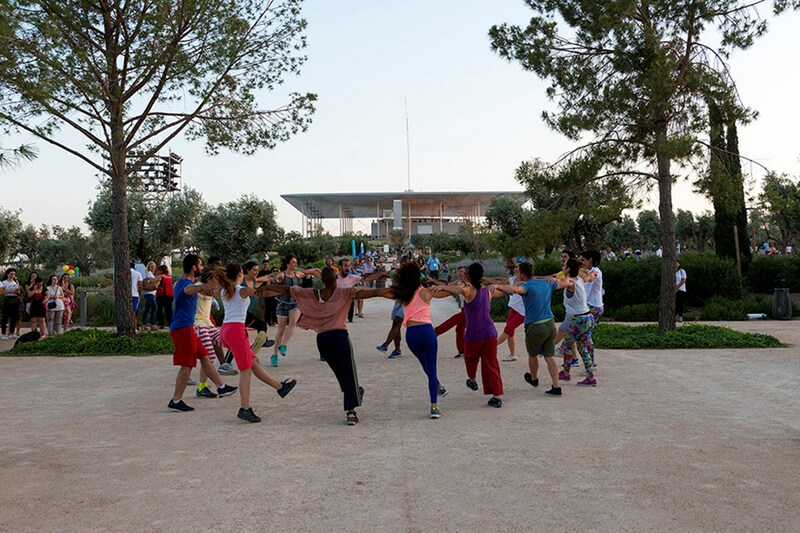 Activities at the Stavros Niarchos Park. 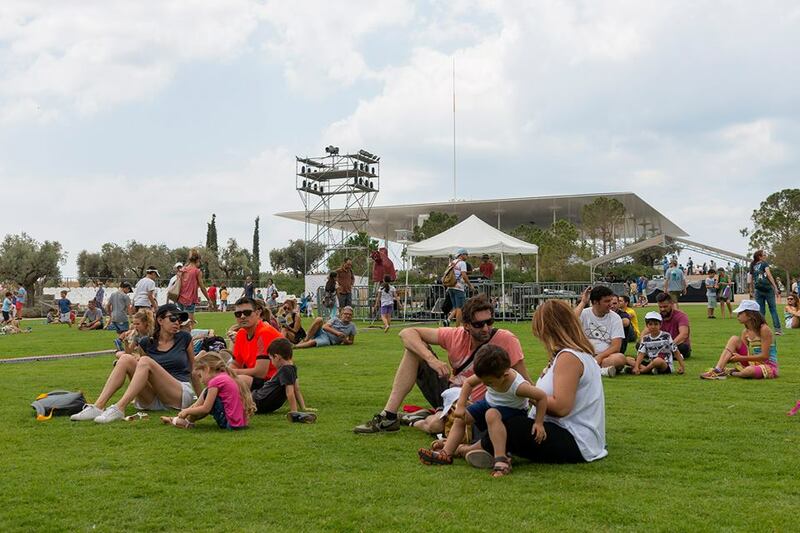 ​The Great Lawn, the spot where all paths meet, is the heart of Stavros Niarchos Park. The lawn is natural (grass paspalum), requires little watering and is suitable for the Greek climate. The Great Lawn is surrounded by coniferous trees, olive trees and herbs that grow in the Greek climate and create an impressive contrast between shades and the light of Attica. The Great Lawn is closed for some days in order for the lawn to “rest” and grow naturally. Greece’s strong horticultural tradition is celebrated in the open, sunlit Mediterranean Garden. The plant palette alone will make the garden a destination: evergreen and other endemic plants such as boxwood, coronilla, cistus, and lentisc, salvia, oregano, thyme, lavender, rosemary, roses and euphorbias – all add to the sensual pleasure of a visit. Each month will bring a new color, and each season will introduce a different combination of flowers or foliage. From the Mediterranean Garden, curving landscaped pathways wend their way up a gentle grade to a summit 32 m high. Beneath the earth is the building that houses the Library and Opera House, making the hill the green roof for the structure. One of the largest in Europe, the green roof significantly reduces air conditioning requirements. The summit offers spectacular 360-degree views of the sea to the west, the Acropolis to the east, and the cultural and educational park below, as well as of the Agora, the central plaza between the Library and the Opera House. Another reward awaits the visitors of the Park’s summit: a 900 m² glass-walled Reading Room, a space for people seeking a quiet area to read and reflect or to appreciate the view. The Reading Room is in terms of functionality an extension of the Agora, and will become a place to organize cultural and educational events as well. 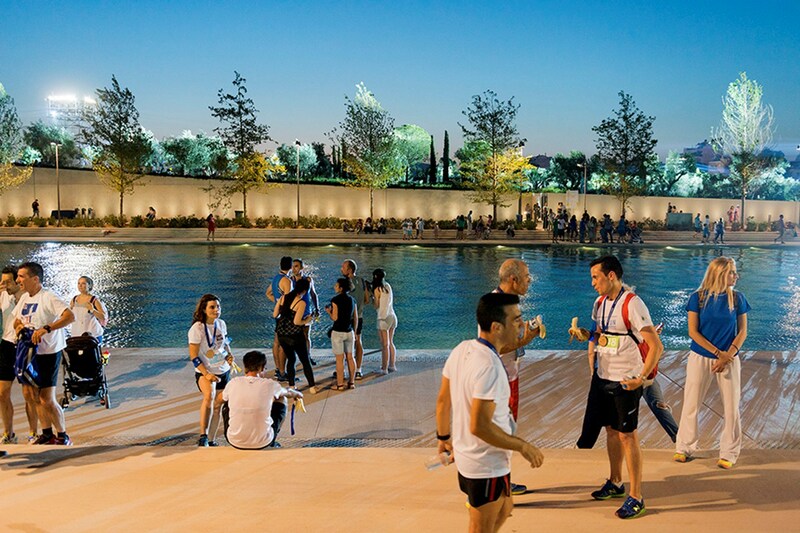 The spectacular features of the Stavros Niarchos Park are not all earthbound. The energy needs of the buildings will be met by a 100m x 100m photovoltaic solar panel canopy. Soaring 14 m above the summit, the canopy extends outward from its perimeter. An engineering and construction wonder, supported by 40 sinewy metal pillars, the canopy will make a fascinating addition to the city skyline. Coupled with other environmentally innovative designs and practices, the project aims to earn Platinum or Gold Leadership in Energy and Environmental Design (LEED) certification, the first such designation in Greece and the first for a project of this scale in Europe. At ground level, a tree-lined pedestrian Esplanade runs parallel to the glass façade of the structure. Alongside is a wide canal, a figurative extension of the adjacent sea. The Esplanade readily accommodates people with special needs, and is suitable by day for running, biking, and other activities. Directly across the Agora and on the other side of the canal, wide marble steps offer a space for impromptu performances. The Stavros Niarchos Park is designed with a principle of flexibility. As visitors become familiar with its usages, the Park’s structure will evolve to support the public’s new needs and preferences.